Week of Inspirational Maths - The DP of Fernando R.
This week was to get us motivated to do maths and believe in ourselves. We took this week so that we could be reminded that mistakes are a part of learning and that we should accept that we will make mistakes, but that they will make us stronger. I believe each week we did different problems that challenged us in a different way because we needed to open up our minds to problem solving and using the Habits of Mathematicians to figure out the problems. The first problem of the week was Building Shapes. We received a rope tied in a loop and a picture of different shapes including 3 dimensional shapes, we had to create the shapes with the rope and no measurement. For example, the square seemed easy to make but the corners had to be exactly 90 degrees and all equal sides (accomplished by first folding the rope in half and then half again, taking one corner each, and using a paper as a perfectly square angle). The second problem Number Penny Visuals. We started the problem with a pattern finding challenge to stimulate our creative process of looking at the bigger picture, then we started on the actual problem. We received 100 pennies and a sheet with dot shapes similar to the shapes in the warm up, the task was to divide up the pennies throughout all dots on all shapes. Each shape could have different amounts of pennies but each dot for a certain shape had to have the same amount of pennies. The third problem to solve was the One Cut Geometry. For this problem we received one square piece of paper and the instructions to create a scalene triangle in the center (that is, not using the edge of the paper as a line), we needed to fold the triangle in such a way that we could cut it in one straight cut. Upon first description of the problem I figured it would be easy because you just fold the two sides down to the base line, but when I realized that it was more complicated than that and remembered that by folding something you created other lines in different directions, I had to get more creative and strategic about the folds. The last day, we did the problem Square Mania. This problem took trial and error as well as some calculation to solve. with some examples given to us we understood that we needed to count all of the possible squares in a grid filled rectangle (i.e. large squares, small squares, etc.) as well as the line segments that made up those squares. For the final part of it, we had to create a grid of 100 possible square combinations with the smallest amount of line segments. Once I got down to the trial and error of it and really tried to look for patterns it was really all a blast almost as if I had focused in on the problem and was determined to get the best answer. The first video about strategies for learning maths talks about ways to get around a mental block on a problem. The tips shown are very similar to the Habits of Mathematicians in that they involve looking for patterns and collaborating at times. I feel that this resonated with me because I often get stuck on a problem and I try to find the best way to get around an obstacle. The second video about how speed isn't important was very interesting because it suggested that we each take our own time to solve problems and that we shouldn't be ashamed or worried if we don't get it at first. I find that while this might be true for me I also want to find better ways to be faster and more sharp at solving problems. The third video of the week talked about how brains grow and change. I really connected with this one because I find that when I practice something over and over again I tend to master it and find it easier so I really advocate for practicing and training your brain. The last video was about how mistakes are a vital part of learning because they strengthen your path of learning. I feel that when I make mistakes I mostly learn from them and carry on in a different direction that I might not even have thought of at first so its always great to put an idea out there and if it doesn't work you might get something from it. ​The problem that stood out the most to me this week was the Number Visual Pennies. In the Number Visuals Pennies problem you are given five shapes made out of dots, the smaller the dots get, the more intricate the shapes become. The goal is to get all 100 pennies that you are given into all dots on all shapes evenly, you can change the number of pennies on each shape but inside of that shape the pennies must be equal on each dot. I really enjoyed this problem because it forced my mind to open up and see the bigger picture. In this problem, to distribute the 100 pennies evenly you couldn't just go shape by shape, you had to actually strategize and come up with a pattern so that all 100 could fall into an even distribution at once. At first I thought to just go one shape at a time and try all combinations until one gave me the right one that I wanted, I figured that this wasn't the best way of using my time so I decided to rethink my plan. I took some time to just strategize and think about the problem before coming up with the idea that there must be a relationship between the amount of pennies on each dot and the amount of dots per shape. I assumed that by putting the smallest amount of pennies on the shape with the smallest amount of dots and going up from there I wouldn't get all 100 on the page so I flipped it around. I started by putting one penny on shape 5 (the one with the smallest and most dots) and working my way up but I had found that the spread wasn't even enough to fit the requirements, so I added one penny to each dot (i.e. two on shape 5, three on shape 4, etc.) this almost worked but I was left with 6 that weren't distributed properly so I just moved one from each stack in shape 3 (the shape with six dots) and filled the dots that needed more pennies. During the problem I faced some challenges such as the frustration of getting the amount of pennies distributed so close to 100 but not quite hitting the mark. I solved these challenges by reminding myself that this was a trial and error problem and that I would make many failed attempts before being successful. 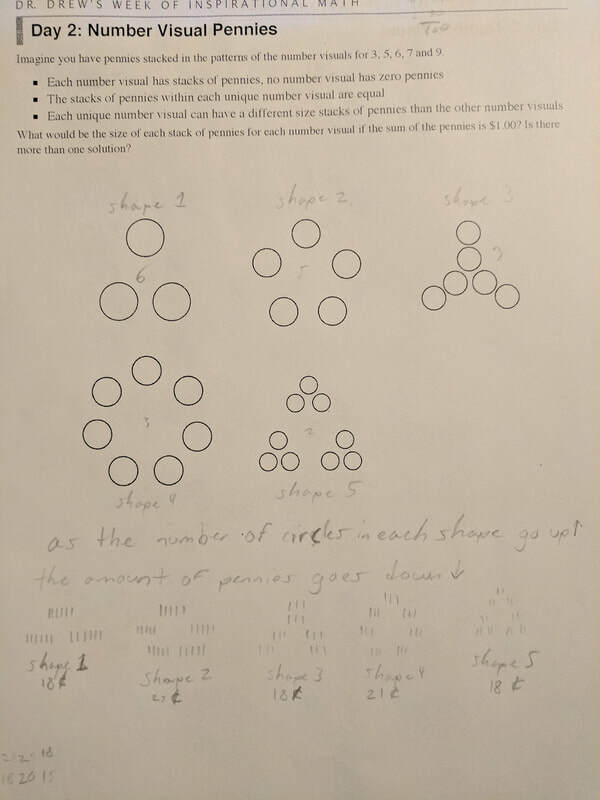 I definitely used Conjecture and Test in this problem because I was always strategizing, coming up with ideas, testing those ideas and doing the same process all over again until I finally found the right balance of pennies on each dot on each shape. ​Hopefully I can take the lessons I learned from the videos as well as the interesting problem solving skills I applied to my thinking for the daily challenges and expand on them throughout the year. I know that most of these values work in regular class work but I want to advance them so that I have the tools to keep a calm head and problem solve during tests or when I am under an actual time constraint. I believe that I will always keep the Habits of Mathematicians in mind because those tools are essential to being the most productive I can be to feel the satisfaction of solving problems.